On a recent New York trip, I picked up fennel pollen at Eataly, Mario Batali's Italian mega-market just off Madison Square Park. Awhile back, I'd been making a recipe (coincidentally, one of Batali's) that called for fennel pollen and I couldn't find it anywhere. So when I saw it at Eataly, I picked some up in case I ever needed it again. Of course, I tried a little bit to see what it was like. Unsurprisingly, a lot like fennel, although more intense than you would expect and even a little sweet. A little goes a long way. For its inaugural use in my kitchen, I opted to sprinkle it over a salad with blackberries, cucumber and arugula. Not wanting to overpower it, I kept the dressing very basic. 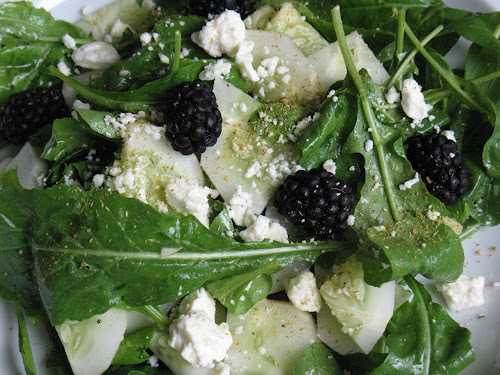 This salad features another unique find: lemon cucumbers. My farmers market has them sometimes. They are thicker and shorter than your regular cucumbers (so basically more spherical) and have a yellow-white skin. They don't really taste different than other cucumbers and they certainly don't taste like lemons, just resemble them. Whisk together the olive oil, vinegar, salt and pepper to make the vinaigrette. Combine the other ingredients in a large bowl and toss with the vinaigrette. After plating, sprinkle lightly with fennel pollen. 1) "Capitol Cocktail: Gin Rickey." The last in this summer installment of cocktails by Washington-area mixologists highlights the city's official cocktail, the Gin Rickey, a simple blend of gin, lime and sparkling water served over ice. I think I could use one about now. 2) "Curry-Glazed Pork," Dinner in Minutes recipe by Bonnie S. Benwick. For this dish, Benwick took a much longer recipe from a gluten-free cookbook and adapted it into a quick 30-minute meal. The pork cutlets are cooked in a pan and then glazed with a soy, garlic, curry and honey sauce. 3) "Lids, rings and pings, now more than ever," article by Bonnie S. Benwick. Benwick's cookbook column looks at the resurgent canning craze, reviewing six recent volumes on the subject. 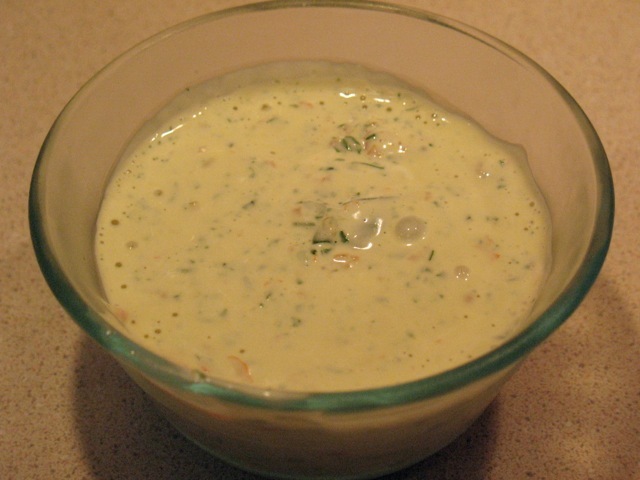 There are a host of related recipes too, including one for Summer Herb Brown Mayonnaise, which technically doesn't strike me as a preservation recipe (since it only lasts a week in the fridge), but sounds really easy and delicious. 4) "Is this the nudge some Americans need?" Smarter Food column by Jane Black. Black takes a look at Linkwell Health, a company that works with health plans and food companies to encourage certain consumer segments to eat better by providing them targeted coupons. The story discusses how this approach--more so than the often expensive organic/local/whole foods one--may have greater impact in improving many people's diets. "Italy to Brooklyn, Fig by Fig," A Good Appetite column by Melissa Clark. Clark writes lovingly about the fig tree growing on her Brooklyn property, which is a seasonal source of fresh figs (I'm jealous--I don't think I've ever had a fresh fig). She accompanies the stories with recipes for Lamb and Fig Kebabs with Honey and Rosemary and Fig-Hazelnut Financiers, which both sound really good. "Magic Measured in a Pile of Salt," Letters from Paris essay by Elaine Sciolino. Someone in the Sciolino household must do something far more lucrative than write for a newspaper food section, given that she talks about how her family rents a house on the French west coast every August (how cool is that!). In this interesting piece, she talks about the sea salt harvest, from which come France's famous gray sea salt and fleur de sel. "Fresh Beans in the Salad Push Cans to the Side," City Kitchen column and recipe by David Tanis. I've seen some interesting beans at the farmers market lately, and Tanis's Fresh Multibean Salad with Charred Red Onion may be the push I need to pick some up. The recipe, which calls for using a mix of shelling, green, Romano and yellow wax beans, sounds tasty. "At Eataly, the Ovens and the Cash Registers Are Hot," article by Glenn Collins. Last time I was in New York, I made my first visit to Eataly, Mario Batali's large-scale Italian market off of Madison Square Park. It was a really cool place, where I picked up such rarities as trofie pasta and fennel pollen. So I'm glad to hear that the market is doing very well financially, and national expansion is apparently underway (come to DC!). The New York Times. Kind of a quiet week in my opinion for both publications (understandable, since it's the week before Labor Day). I give the edge to the Times for some great recipes and peak at the success of Eataly. 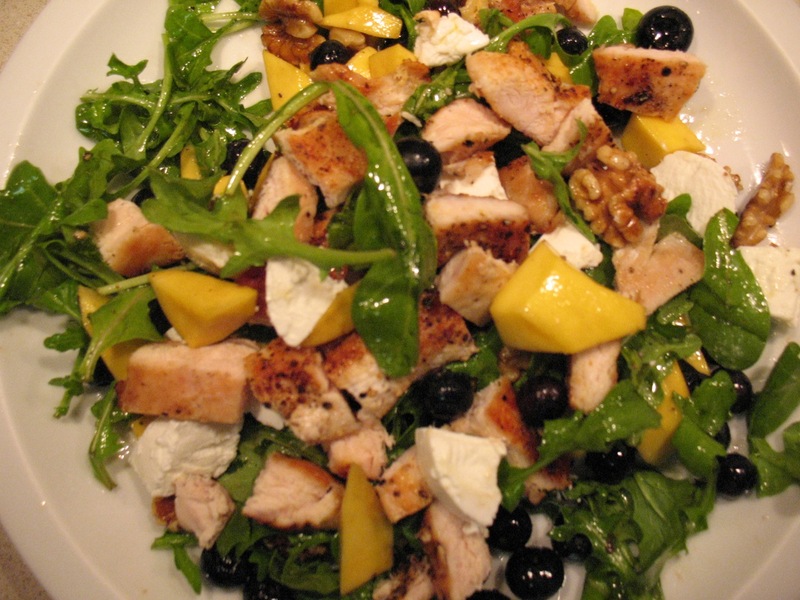 "Rocket" is the term Brits use for Arugula, also known as Rucola. I think its the perfect term for the green, especially if freshly picked, when its peppery bitterness can be so intense that it burns your mouth. That's when you know you're eating a "rocket" salad and not just arugula. 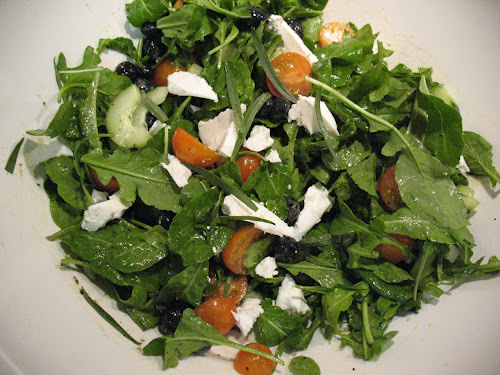 Here I've paired the green with seasonal fresh blueberries and tomatoes, tossed with a zippy vinaigrette, some goat cheese, and a bit of anise-like flavor, courtesy of the tarragon. Whisk together vinegar and olive oil with salt and pepper to make vinaigrette. Combine other ingredients in large bowl. Toss with vinaigrette. This week, I'm going to focus on a getting up a few dishes I've made recently with berries, specifically blueberries and blackberries, which are in season right now, but probably not for much longer. This dish appeared recently in the New York Times. 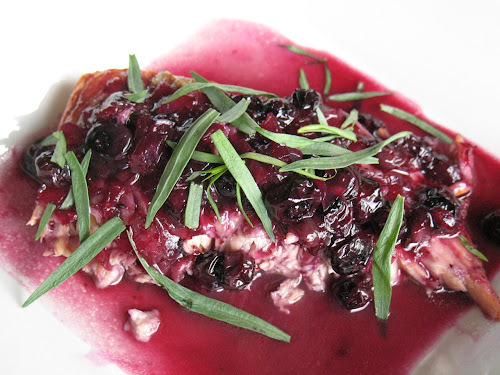 It strikes me as a very "Oregon" dish--salmon and blueberries are, after all, pretty abundant there. A neighbor told me how much she liked this dish, but noted that it has a lengthy cooking time. In adapting the recipe, I was able to save some time by broiling the salmon, instead of roasting it. That I was only making half of much blueberry sauce also probably saved some time. Additionally, I brightened the dish a bit with some fresh tarragon. 1. Preheat the broiler. Position oven racks 4 and 10 inches from broiler. 2. In a medium saucepan over medium heat, combine onion, wine, vinegar, thyme, cinnamon and a pinch of salt. Simmer until most of the liquid has evaporated (about 1/4-1/3 cup liquid remains), about 15 minutes. Remove and discard thyme sprigs and cinnamon sticks. 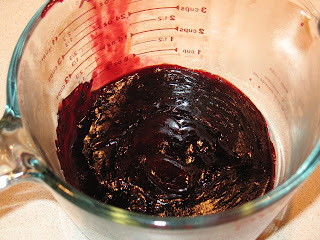 Add blueberries, butter and honey, cooking until the berries soften and the sauce turns a deep pink, about 4-5 minutes. Set aside. 3. Place salmon on oiled rimmed baking sheet, skin side down. Spray exposed flesh side with olive oil. Broil 4 inches from broiler about 5 minutes. Turn fillet over and broil another 5 minutes. Remove from oven and discard skin. 4. Place broiled salmon in an oiled 9 x 9 inch baking dish. Pour blueberry sauce over salmon. Place in oven and broil 10 inches from broiler about 5 minutes. Cut fish in half and remove, placing on plates. Return baking dish with remaining blueberry sauce to oven and broil 10 inches from broiler about 5 minutes to concentrate sauce. Spoon sauce over fillet, season with fresh-ground black pepper and sprinkle with tarragon. Before tomato "fortnight" concludes, I wanted to share two more great uses for the Roasted Tomato Puree that was the base of the two pasta dishes I've posted in the last 2 weeks. This was what I meant to make instead of the Extra Fresh Pasta with Ricotta and Roasted Tomato Sauce, except that the grape tomatoes I'd bought for the dish went bad (and I didn't discover it until I started cooking). Make it the same way as that dish except, when adding the roasted tomato sauce the pan with the cooked garlic, also stir in two cups of halved grape tomatoes. Roasted tomatoes also make excellent homemade pizza sauce. After roasting the tomatoes at 350 F for 2 hours, before pureeing in the food processor, I added dried oregano, additional salt, fresh-ground black pepper, garlic powder, and a pinch of red pepper flakes (all of that was done to taste, so use as little or as much as each as you like). 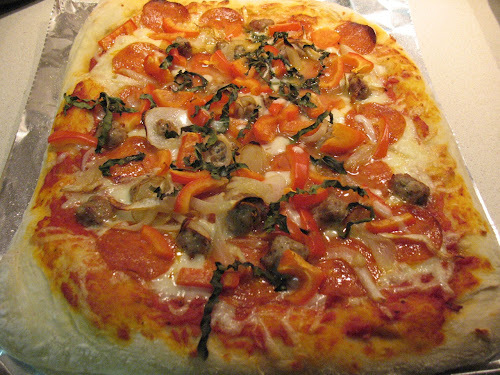 I used the sauce on pizza with mozzarella, pepperoni, Italian sausage, caramelized onions, red pepper and basil. Although this may look like the surface of another planet, it's actually a baking sheet prepared with olive oil and cornmeal, awaiting pizza dough. This is a another great dish to celebrate summer vegetables at their peak, specifically eggplant, zucchini and tomatoes, the triple-play foundation of this classic French staple, which often includes a mix of herbs, garlic, onion, and potentially other things. It's pretty versatile that way. Even the cooking method may vary. Is it oven or stovetop? All ingredients separately or all together? 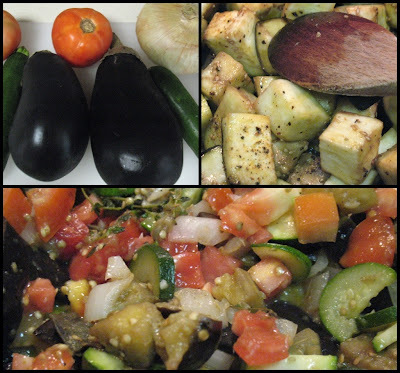 I contemplating making my ratatouille as a roasted dish, but ultimately opted for stovetop because it is faster. Although I didn't cook the vegetables separately, I did cook them in stages, adding the vegetables that need to cook longer first (the eggplant, in particular) and those that need less cooking last (like the tomatoes). This is an approach favored by Mark Bittman who, as usual, seems to know what he's talking about. 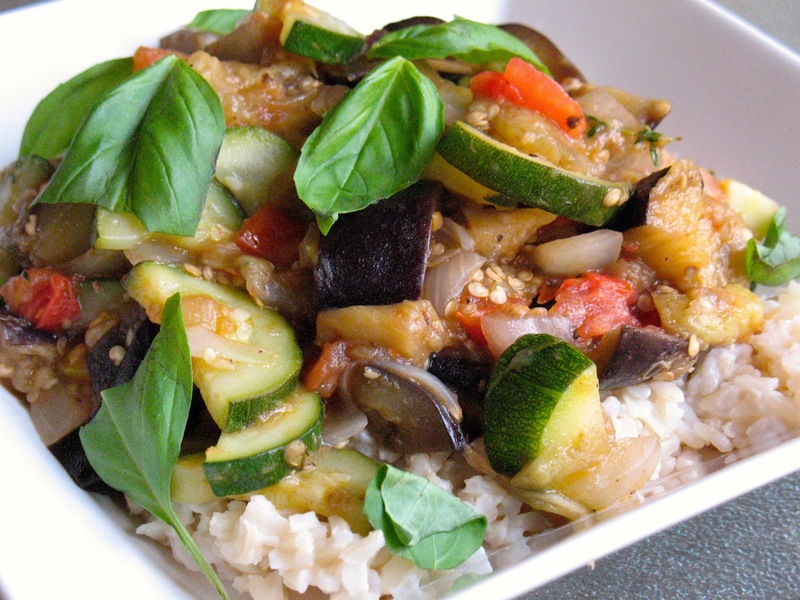 Ratatouille by itself makes an excellent side dish or, if topping a pile of rice or pasta, a main dish. I served mine over some buttered brown rice. 1. Add cubed eggplant to a colander set over a bowl (or in the sink). Sprinkle with salt, mix well and let sit for about 30 minutes. Rinse well. 2. Heat olive oil in a large frying pan or steep-sided sauté pan. Add eggplant, and saute until it softens and turns a golden color, about 20 minutes. Add onion and zucchini; sauté 5 minutes. Add garlic and thyme; sauté another minute. Add the tomatoes and cook another few minutes until they soften. Season to taste with salt and fresh-ground black pepper. Serve over rice or pasta as as main dish or by itself as a side dish, topped by fresh basil. 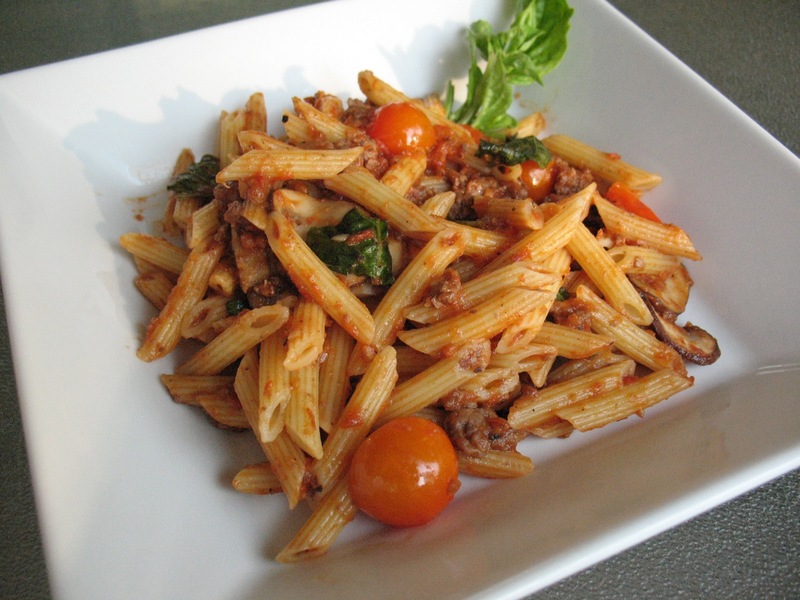 Last Saturday, I posted a recipe for Tomatoes Two Ways Pasta, a dish featuring roasted tomatoes. Roasting brings out tomatoes’ depth and rich sweetness. They are so incredibly good, that I wanted to make a second pasta dish along similar lines, this time vegetarian. This dish also features fresh, homemade ricotta and homemade noodles. 1. In a medium saucepan, heat olive oil over medium-low heat. Sauté garlic until fragrant, about 10 minutes. 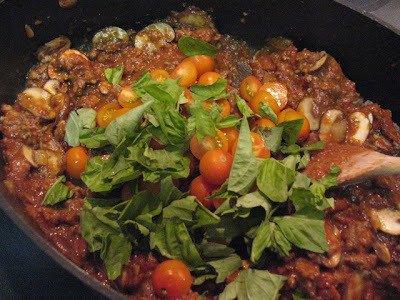 Add tomato sauce and half the basil and reduce heat to simmer sauce while you cook the pasta. Season with salt and fresh-ground black pepper. 2. Gently heat the ricotta in the microwave. Place cheese in a microwave-safe bowl and heat at 50 percent power for 90 seconds, stirring halfway through and at the end to evenly distribute heated cheese. 3. To serve, spoon a generous portion of pasta in a bowl. 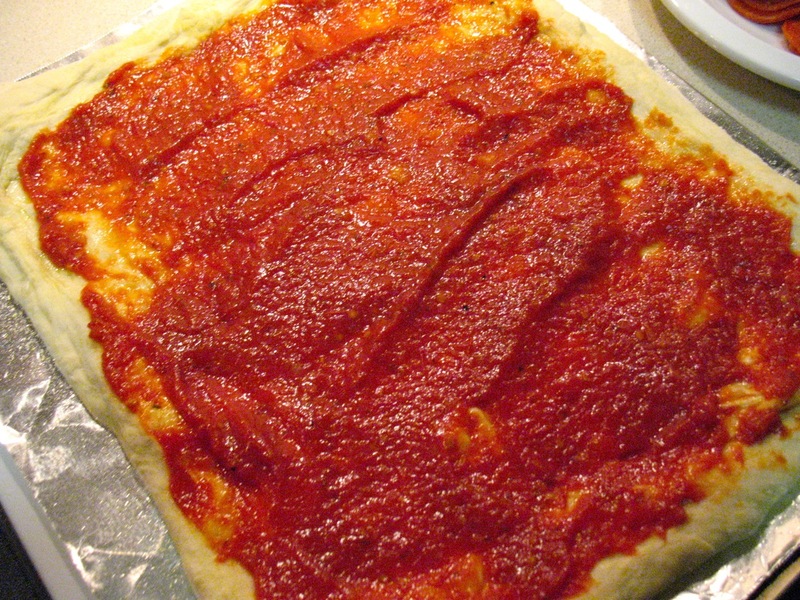 Top with a 1/2 cup of tomato sauce and 1/4 cup of fresh ricotta. Sprinkle some fresh basil ribbons on top. 1. Preheat oven to 350 F. Quarter tomatoes and put in an 9 X 12 glass baking dish (don't use aluminum). Spray with olive oil or toss with a couple tablespoons and season with salt. Roast tomatoes until shriveled and just starting to brown, about 2-3 hours. Set aside to cool and then puree in a food processor. Store in a jar in the refrigerator. 1. Pulse flour and salt in food processor a few times to combine. Add eggs all at once, turn food processor on, and process about 30 seconds until the dough comes together in a ball. If it is sandy and not clumping, add a tablespoon or two of water. If it comes out too sticky, add some additional flour when kneading. Briefly knead the dough while forming it into a ball, dust with flour and cover with plastic wrap or a towel and allow dough to rest about 30 minutes. 2. 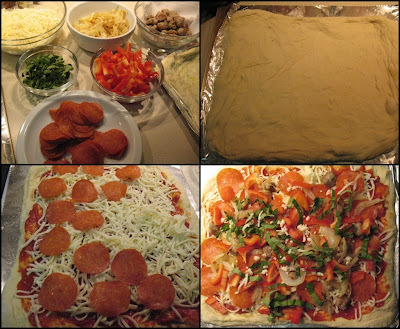 Divide the dough into 5-6 pieces and form into thin pasta sheets using a pasta machine. Cut with a pasta cutter or by hand. Cook in salted boiling water about 3 minutes. Set aside in an oiled bowl until ready to use. 1) “Bargains From American Vines,” The Pour wine column by Eric Asimov. Asimov showcases 12 affordable ($15-$20) domestic wines of various white and red varietals. Lots of California, of course, but not exclusively. The Oberon Napa Valley Cabernet Sauvignon 2009 piqued my interest. He describes it as an example of an affordable wine made from high-quality grapes—a “hush hush” phenomenon Chris and I heard about in Napa last year that came about because of the recession. Rather than drop the price on their top-tier labels, wineries instead sold their top grapes to be produced under different names. I haven’t tried the wine yet, but I’m hoping it will be something special. 2) “A Pancake Brings Corn and Berries Together,” A Good Appetite column and recipe by Melissa Clark. I’ve been on a corn kick lately and I like blackberries, so this pancake that brings the two together sounds really good. 3) “A Few Things All Baskets Need,” How to Cook Everything column by Mark Bittman. Mark shares a couple of picnic basket favorites, including his hummus, which I’ve made before. I would definitely suggest taking his advice about adding extra water, as my hummus came out too thick when I made it. 4) “Fire Meets Its Match: Spices,” article by John Willoughby and Chris Schlesinger. Those fortunate to have an outdoor grill may be growing tired of their traditional standbys (I envy such fatigue, really), so in swoops Willoughby and Schlesinger to suggest turning to Indian cuisine for inspiration to spice up those dishes. The recipes sound good, particularly the Spice-Rubbed Grilled Chicken Thighs with Tomato-Cucumber Relish. 1) “How ‘no’ gets translated,” feature by Tim Carman. The Food Section guys score a cover story trifecta today: we get front-page work from Carman, David Hagedorn and Joe Yonan, all of them doing what they do best. Carman, of course, takes the most academic route, an interesting look at how restrictions on certain imported foods in the United States can have cultural consequences. He puts particular focus on the California foie gras ban and what that means for the French who live in the U.S., bus also examines restricted delicacies like pufferfish (the infamous sushi dish that will kill you if prepared wrong), shark fin and haggis. 2) “Even on vacation, a cook can learn,” The Process column by David Hagedorn. On vacation at his Alabama lake house, Hagedorn treats us to a peak inside all the amazing food his family is consuming there, including a delish recipe for Smoked Chicken Salad. 3) “With fruit, I’m flexible,” Cooking for One column by Joe Yonan. Speaking of family getaways, Yonan is still sequestered on his family’s southern Maine homestead, from where he tells us that the arduous task of satisfying his sweet tooth involves going outside to the garden and picking something. Oh Joe! He tells us how although the berry harvest was disappointing this year, he’s definitely excited for the stone fruit crop. The accompanying Faux Summer Berry Tart sounds easy and satisfying. The Washington Post. In an essay-heavy week (I didn’t bother telling you about the Times’ essays on why new fathers get fat and how busy parents can get other people to plan their dinners for them), I favored the great stories and vacation postcards from Carman, Hagedorn and Yonan. The New York Times recently ran an article about cocktails made from Aperol, which is apparently the hottest thing in mixology. The Italian aperitif has a slightly bitter orange flavor, not as a sharp as Campari (both are made by the Campari company). I like that the Times referred to it as a spirit the color of a sunset and drew the inspiration for my drink from that. Add gin, Aperol, St. Germain, lemon juice and bitters to shaker with ice. Shake well and pour into rocks glass with ice. Top with club soda and stir. Hot tomato soup is great, but in the summer, with fresh tomatoes available, cold gazpacho hits the spot. There are apparently many different version of this Spanish soup. I was most interested in the Andalusian version, which includes bread to give the soup added thickness. Set the finely diced and salted vegetables in a strainer above a large bowl. The salt will break down the vegetables, exuding juice while releasing flavor. As usual, the America's Test Kitchen crew has perfected a rather tasty version. I made very few changes and came up with a winner. 1. 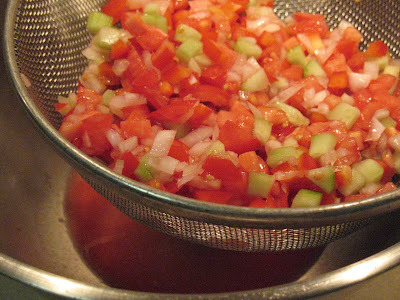 Roughly chop 2/3 of the tomatoes, half of the cucumber, half of the bell pepper, half of the onion and the garlic. Place in a large bowl and toss with 1 1/2 tsp. salt. Set aside. 2. Finely dice the remaining tomatoes, cucumber, bell pepper and onion. Toss with 1/2 tsp. salt and place in a fine mesh strainer over a bowl. Set aside for an hour. Do not discard the juice that will exude (there will be about 1/4 cup). 3. Transfer the diced vegetables to another bowl. Add the bread to the exuded juice and let it soak up. Add the soaked bread to the bowl of roughly chopped vegetables and combine. 4. Transfer half of the mixture of roughly chopped vegetables and bread to a blender and blend on medium speed for about 30 seconds. With the machine still running, through the opening at the top, slowly drizzle 1/4 cup extra-virgin olive oil (I took about a minute to drizzle), continue blending until mixture is very smooth, about 3 minutes total blending time (note: the original recipe said to now strain the mixture, but I decided this was unnecessary, as it is very smooth and somewhat thick). Repeat with the other half of the vegetable-bread mixture and olive oil. 5. Combine the two batches of blended soup in one container (I used a pitcher), add the sherry vinegar, basil, fresh-ground black pepper and half the finely diced vegetables. Stir to combine. Serve garnished with additional diced vegetables. Tomatoes are an amazing vegetable, not just because their unique flavor is, according to Tomatoland, the product of 15-20 volatile compounds, but that you can do so many things with them. This time of year, you can get amazing fresh tomatoes that are so sweet and succulent. Yet, roasting tomatoes deepens the intensity of their flavors. 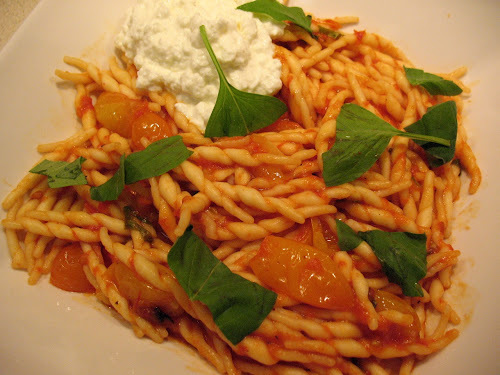 With this pasta, I wanted it both ways: the rich, depth of roasted tomatoes and the fresh sweetness of fresh tomatoes. To heighten these two extremes, I also included ground beef and mushrooms, as well as garlic and basil. When roasting the tomatoes, be sure to roast them in a nonreactive baking dish. Specifically, the acid in tomatoes will dissolve aluminum, so don't roast them directly on an aluminum baking sheet (you can still use one if you put parchment down) or an aluminum foil-lined pan. I used glass baking dishes. The golden grape tomatoes that my farmers market sells are simply amazing. I get them every week when they have them, sometimes two containers. You can just eat them like candy, they are so good. 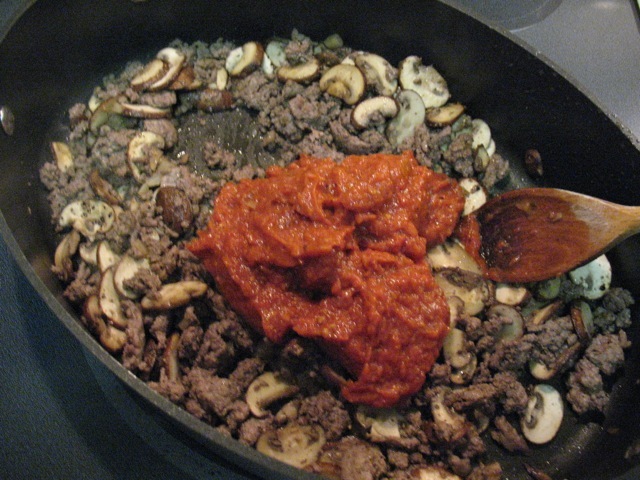 1. heat a large sauté pan over medium heat, brown ground beef. Remove beef but keep drippings in pan. Add 1 tbsp. olive oil, mushrooms and garlic. 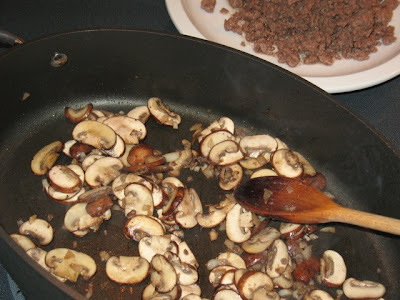 Sauté until mushrooms are lightly browned and garlic is soft and fragrant, about 10 minutes. 3. Add the browned beef back to the sauté pan with the mushrooms and garlic, season with salt and pepper and then add the roasted tomato sauce, the reserved pasta water, grape tomatoes and basil, stirring to combine. Cook for 1 minute. Add the pasta and cook for an additional minute. Serve pasta topped with parmigiano-reggiano. 2 lbs. fresh tomatoes (I had a mix of plum and larger tomatoes; I halved the plum tomatoes and quartered the larger ones). 1. Preheat oven to 350 F. Divide tomatoes between two roasting pans. Spray or toss with olive oil (about 1-2 tbsp. worth) and season with a little salt. 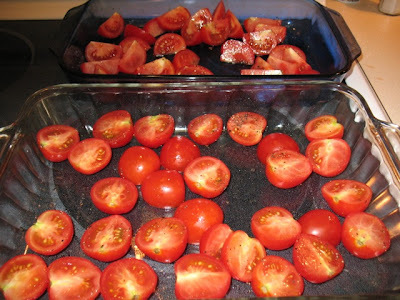 Roast in the oven until the tomatoes have shriveled and started to brown around the edges, about 2-3 hours. Watch after 2 hours to prevent burning and stir occasionally (every half hour or so). Allow to cool, then puree in a food processor. Store in the refrigerator. Anyone familiar with my eating habits, knows that berries were one of the last holdouts from my childhood picky-eater days. In fact, it's only been the last couple years that I've embraced them, starting with blueberries, then blackberries and strawberries. Today, I enjoy them as snacks, in desserts, salads and cocktails. 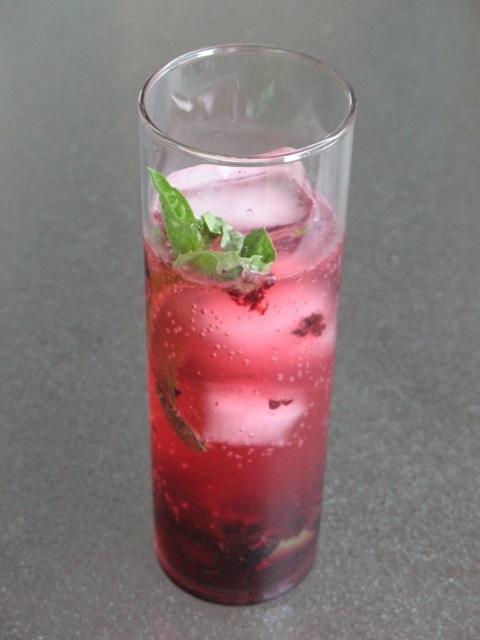 Muddling berries is great way to impart some fresh summer flavor into a cocktail. For this recipe, I combined the sweetness of blackberries with the fresh taste of mint and some tart lemon. The results were pretty refreshing and, although I used vodka (specifically a small-batch Washington State vodka from Dry Fly distillery), I've also tested this with gin. Both work great, depending on what you prefer. Add mint leaves and simple syrup to glass and muddle. 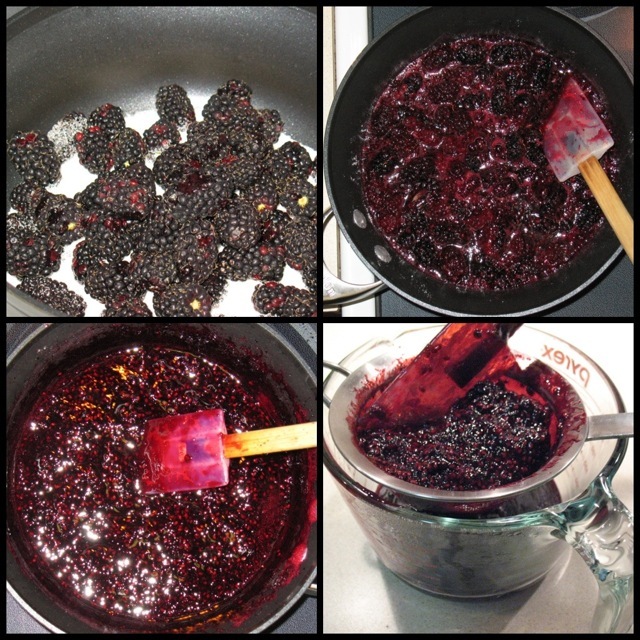 Add blackberries and use muddler to crush berries. Add ice, vodka and lemon juice and stir to combine. Top with club soda. 1) “Seeds of Inspiration: Top Tomato 2012,” feature by Jane Touzalin. It’s the annual Washington Post tomato recipe contest! This morning, a large beautiful photo of sliced red, yellow and green tomatoes greeted readers hungry to see what recipes topped the contest this year. Rockville, Md. resident Barbara Brynelson won the top honor with her Chipotle Shrimp with Tomato-Corn Salsa. A couple of the more unusual recipes that interested me were the Tomato Butter and Ginger-Tomato Ice Cream, which sounds really fabulous. I'm always up for creative ice creams (bacon-tomato anyone?). 2) “For Julia’s 100th, the gift of her kitchen returns,” article by Bonnie S. Benwick. Had she lived, culinary legend Julia Child would have celebrated her 100th birthday today. Thus, the food world was all abuzz, honoring the great woman best known for her landmark cookbook, Mastering the Art of French Cooking and her PBS television cooking specials (let’s also pause to note that she was very memorably immortalized in film recently as portrayed by the equally masterful Meryl Streep in Julie & Julia). The Post’s story focuses on the Smithsonian National Museum of American History’s reopening of its Julia Child kitchen exhibit, featuring Ms. Child’s actual kitchen re-created in loving detail with all her original equipment. It will accompany a new exhibit, FOOD, set to open in November. The kitchen is open for a limited run, but will close again in a few weeks to prepare for the full exhibit. 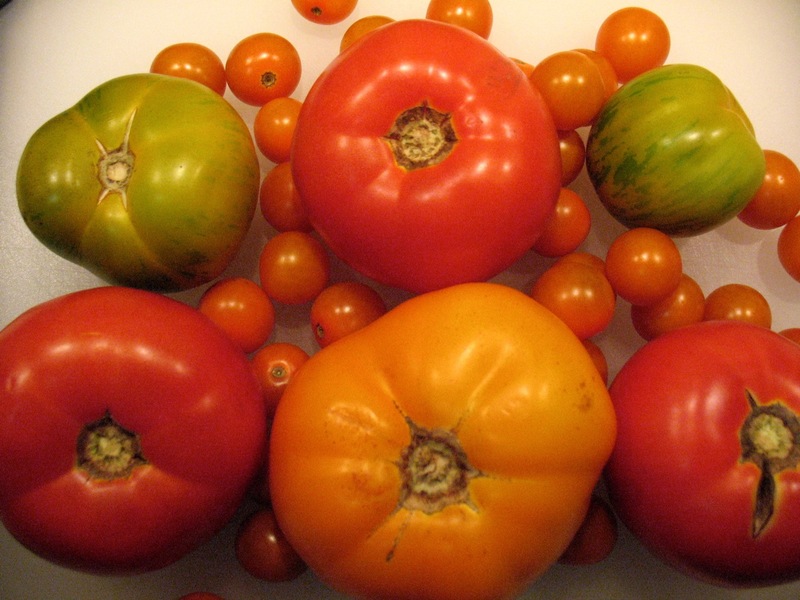 3) “You can’t improve tomato perfection, so amend it,” Smoke Signals column by Jim Shanin. It wasn’t just the contest entrants that got into tomatoes today, as several of the Food section’s writers also offered their own takes. 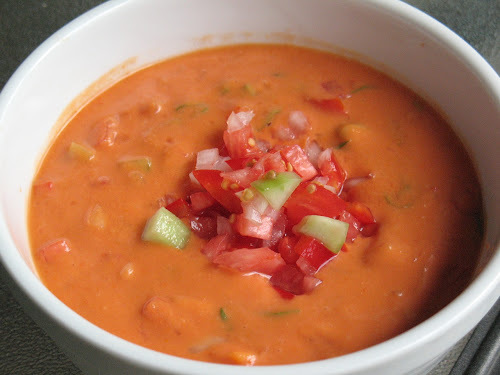 Jim Shanin, in particular, dove into the subject of grilled tomatoes, offering two delicious soup recipes: Grilled and Chilled Tomato Soup and Fire and Smoke Gazpacho. 4) “Cheese-Baked Egg-Stuffed Tomatoes,” Dinner in Minutes column and recipe by Bonnie S. Benwick. The dish, which sounds like a real winner, includes the Middle Eastern spice za’atar, which I’ve never used before. The recipe comes from the book The New Middle Eastern Vegetarian by Sally Butcher, which I’m looking forward to trying some recipes from. 5) “The intersection of London and San Francisco,” First Bite column by Tom Sietsema. Tom turns his focus on Mayfair & Pine, the new Glover Park gastropub from a husband-and-wife team, which, as the name implies, features cuisines inspired by London (Mayfair is a London neighborhood) and San Francisco (where Pine is a downtown street). I just checked out the menu and I’m intrigued by the Beef Wellington nibbles and Thanksgiving sandwich. 1) “The Gifts She Gave Me,” feature by Julia Moskin. Since they got their tomato special out of the way last week, the Times could more fully focus on Julia Child this week. And focus they did, led by this beautiful tribute by Ms. Moskin, who revealed that she was actually named after Ms. Child. The article is accompanied by several recipes from Mastering the Art of French Cooking: Coulis de Tomates À La Provençale (Tomato Sauce with Mediterranean Flavors), Pork With Marinade Seche (Pork with Allspice Dry Rub) and Clafoutis aux Mûres ou aux Myrtilles (Blackberry or Blueberry Flan). 2) “Memories of a Friend, Sidekick and Foil,” essay by Jacques Pépin. Another loving tribute, this time from someone who knew Julia well and cooked with her frequently. Could you imagine all that culinary talent at work together? 3) “On a Floating Island With Julia Child,” A Good Appetite column and recipe by Melissa Clark. Clark whips up a Floating Island with Apricot Crème Anglaise in honor of Julia’s 100th, a soft meringue cake with custard sauce. 4) “The French Chef’s Detour to China,” City Kitchen column and recipe by David Tanis. Also drawing inspiration from Child is Tanus’s playful attempt at French and Chinese fusion: a Grilled Sesame Chicken and Eggplant Salad. Although she didn’t cook it, Child apparently was a Chinese food devotee. 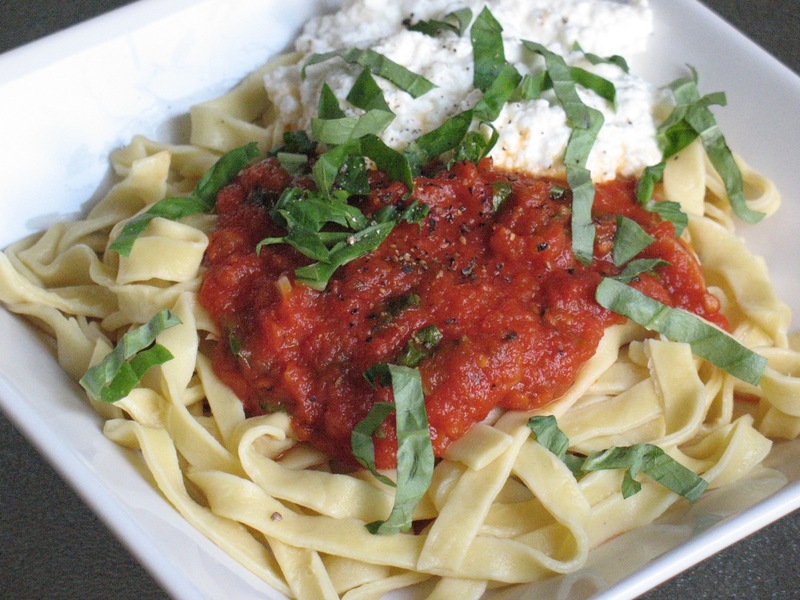 5) “Pulling Together Real Stracciatella,” article by Jane Black. Creamy Stracciatella gets its due in this informative article about the Italian cheese that is a close relative to the currently in vogue Burrata. 6) “At the Fair, Do Calories on a Stick Count?” article by Jane Fritsch. Fritsch examines the fried-food-on-a-stick phenomenon that’s become big at state fairs, particularly Midwestern state fairs. She focuses on Iowa, which offers up the rather nauseating prospect of deep fried butter on a stick. Yes, you read that right. Butter. On a stick. Fried. Thankfully, they rejected deep fried Coca Cola, since, you know, that was crossing the line. The Washington Post. It’s a really competitive week. Lots of good content in both pubs. In fact, I could have kept going (the chocolate-almond-raspberry jam in the Times sounds good, so does the Tabard Inn cocktail in the Post). But in the end, I’m really swayed by all those delicious ideas for summer tomatoes and the Post gets credit for also giving props to Ms. Julia Child. Starting today with the Italian B.L.T., I'm doing not 1 but 2 weeks of tomato-themed content. Tomatoes are available year-round in grocery stores, but many (including me) will contend that the engineering involved in producing tomatoes available anytime except July-September robs them of their essential characteristics, particularly flavor. This is the time to celebrate locally grown fresh tomatoes in all their varied forms: heirloom, beefsteak, zebra, plum, cherry and grape. Yum! It's national sandwich month and fresh tomatoes are hitting their peak. Celebrate both with a B.L.T.! In theory, all you need to make a B.L.T. is bread, lettuce, bacon, tomato and mayonnaise, but variations on this simple theme can be interesting. For this sandwich, I pushed the flavor in an Italian direction, using a tomato-basil mayonnaise in place of simple mayo, substituting arugula for the lettuce and adding fresh mozzarella. You could make it even more Italian by using Italian bread and pancetta, but I prefer the smoky flavor of American-style bacon. 1. Cook bacon in a large frying pan over medium heat until crisp. Drain and cut in half. 2. 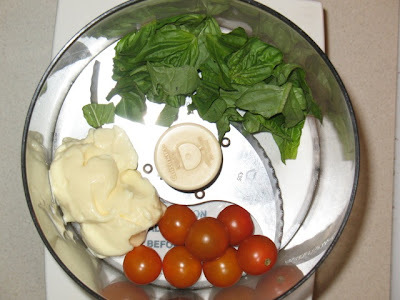 Add mayonnaise, grape tomatoes and basil in a food processor and pulse until smooth. 3. Toast bread slices. Spread with tomato-basil mayo. 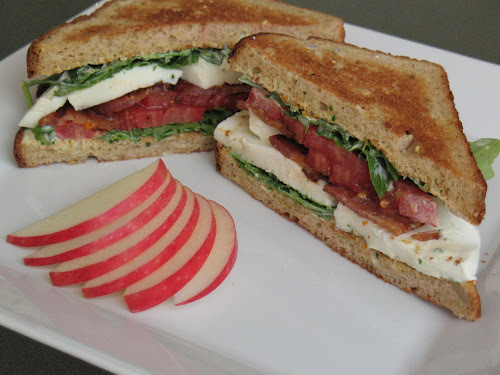 Build sandwich with 2 slices of bacon, 3-4 tomato slices, 2 slices fresh mozzarella and a handful of arugula. Eater recently released its list of the top 33 new restaurants to look forward to this fall. Topping the list in the D.C. area is Range, the first Washington, D.C. restaurant from Chef Bryan Voltaggio, known for his Frederick, Md. restaurants Volt, Lunchbox and the recently reviewed Family Meal. The forthcoming project is quite ambitious. The meat-centric restaurant is expected to offer steak, rotisserie, pizza, a wine shop, coffee bar and bakery. Construction on the Chevy Chase Pavilion, the Friendship Heights indoor shopping mall that will house Range, has pushed back the restaurant's opening from September to November. Reversing its previous decision, Pyrex is once again offering its traditional 2-cup glass liquid measuring cup. In 2009, the line's manufacturer, World Kitchen, announced that the traditional model was being discontinued in favor of a "read from above" model with a conical shape. The redesign proved unpopular with some cooks: America's Test Kitchen has called the redesign a disaster, with testers having difficulty measuring with the product, causing it to fall from the top to the bottom of the organization's ratings for liquid measuring cups. This month's issue of Cook's Illustrated reports that World Kitchen has in fact decided to keep producing the traditional model, ensuring cooks everywhere will continue to enjoy the "squat to measure" move necessary for accurate measurement. 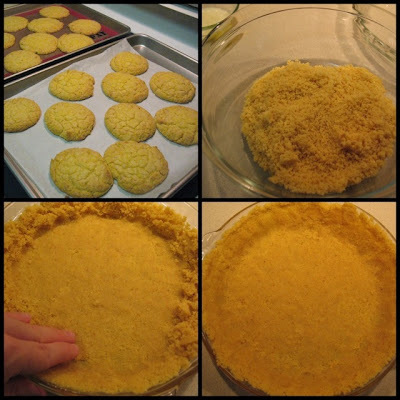 Ever since I made the first batch a few months ago, I've wanted to make corn cookies again. They were just amazingly good, perhaps the best cookie I've ever had. I was also curious about trying the cookies as the crust for a pie. In the second issue of Lucky Peach, in addition to sharing the recipe for the cookies, Momofuku Milk Bar Pastry Chef Christina Tosi suggested a couple other uses for them, including crumbling them into a crust for ice cream pie. Sounds like a great idea if you can manage to squirrel away enough cookies to make a crust before they get eaten. So what ice cream to use? Tosi suggested strawberry, but strawberries are no longer in season, and I wanted to make something really fresh. I turned to my favorite ice cream chef, Jeni Britton Bauer, whose Jeni's Splendid Ice Creams at Home cookbook includes a recipe for Sweet Corn and Black Raspberry Ice Cream (check out this great story about it). 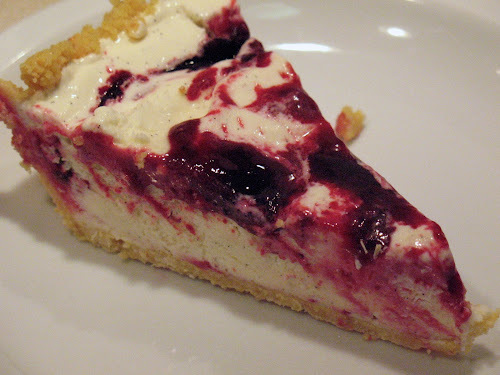 I like the idea of using a different berry, although I didn't want more corn competing with the corn cookie crust. 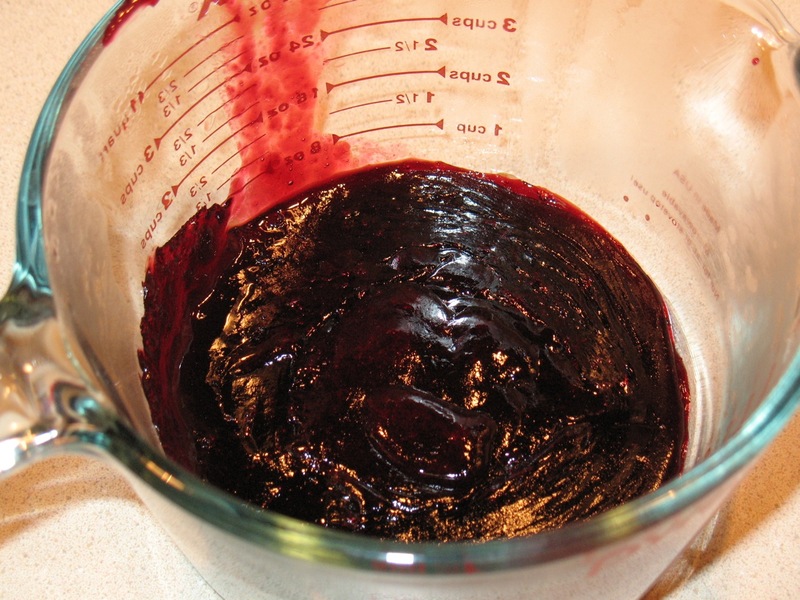 I opted to make a basic vanilla ice cream swirled with blackberry sauce. The pie turned out great, with the corn, blackberry and vanilla flavors harmonizing quite nicely. 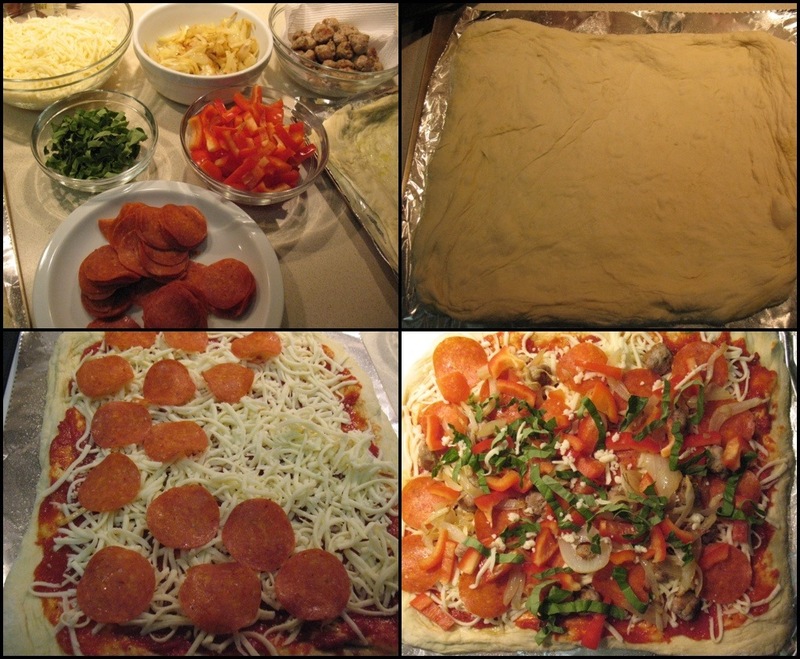 The crust is a bit hard to cut, so I always leave it out 15-20 minutes before cutting a slice (or two or...). 1. 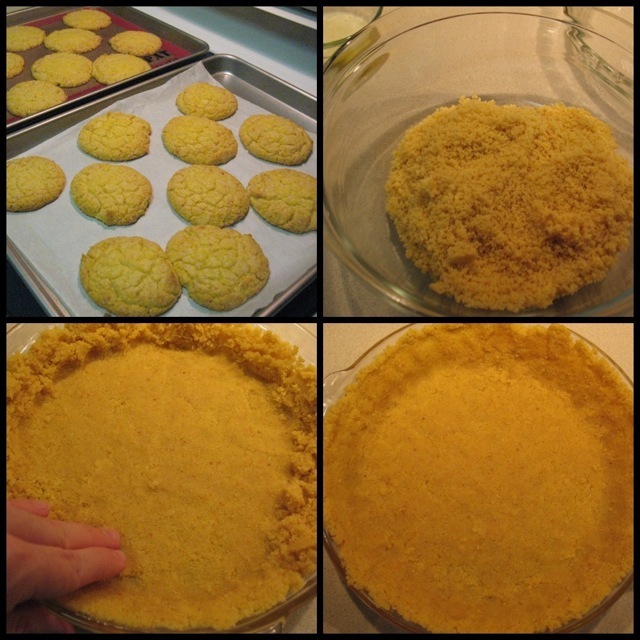 Process corn cookies in food processor until ground to a fine crumb. 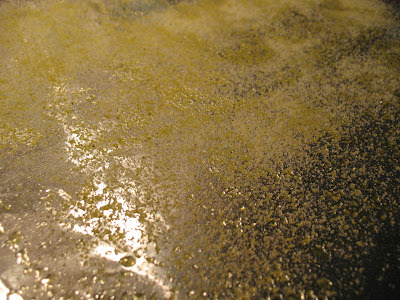 Combine crumb in bowl with melted butter. Press evenly on bottom and sides of a standard pie plate. Refrigerate until ready to use. 2. 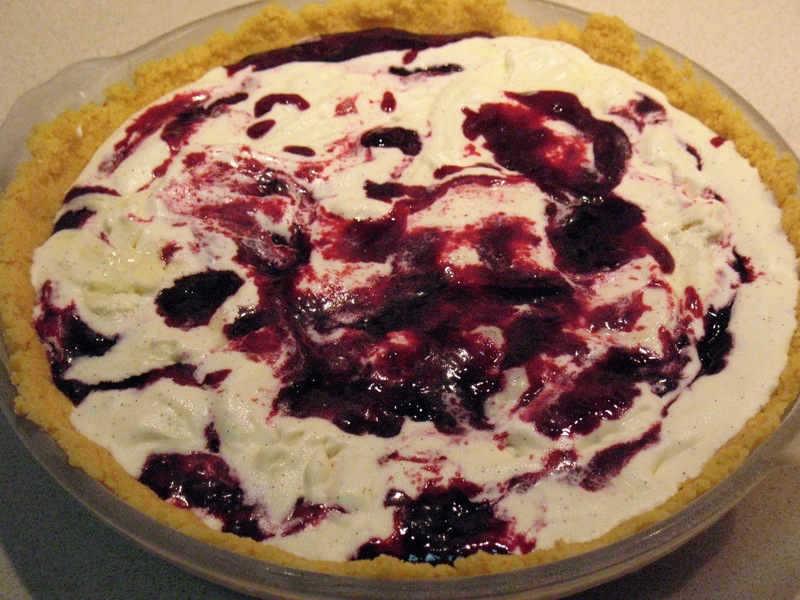 Fill the pie crust by layering in the vanilla ice cream and blackberry sauce (I poured in about a third of the ice cream, then spooned in about a third of the sauce, repeating). 3. Freeze pie. Let set out about 15 minutes before cutting and serving. 1. Combine berries and sugar in a medium saucepan and boil over medium-high heat. Cook, stirring frequently, until the mixture reaches 220 F, about 5 to 8 minutes. (Note: my mixture topped out at about 210 F, after which the temperature started to drop from the moisture loss. In the end, it turned out just fine, but be careful you don't continue to cook this too long and burn it just because the mercury doesn't get up as far as you like. It still turned out great). While cooking, use the side of a spatula to break up the berries. 2. Cool the sauce then pour it through a sieve to remove the seeds. Push on the mixture with a spatula to force it through the sieve. Refrigerate sauce until ready to use. Reheat gentry in a microwave (about 30 seconds on 50 percent power) if it is too stiff to layer with the ice cream. 1. In a small bowl, preferably a liquid measuring cup, whisk together 2 tbsp. milk with the cornstarch. In a large bowl, preferably something with a pour spout (like an 8-cup liquid measuring cup), combine the salt and softened cream cheese. Also, have a large bowl with ice water and a 1-gallon sealable plastic bag ready. Have all these things ready to use before you start cooking the ice cream mixture. 2. Add the remaining milk, cream, sugar and corn syrup to a large (4-quart) saucepan. Split the vanilla bean in half the long way and scrape the seeds into the cream mixture. Add the vanilla bean halves as well. Bring the mixture to boil over medium-high heat and boil for 4 minutes. Remove from heat and slowly whisk in the cornstarch slurry. Return to heat and boil an additional minute, stirring constantly as it thickens. Remove from heat. 3. Slowly whisk the hot cream mixture into the cream cheese until smooth. Pour the mixture into the sealable bag, seal the bag and submerge it in ice water. Chill for 30 minutes, adding more ice as necessary. If not processing right away, put in the refrigerator. Process in an ice cream maker according to manufacturer's directions. Freeze in the freezer until ready to use for the pie, if not ready to use immediately (if you freeze it hard, it will need to soften considerably before it can be spooned into the pie crust). Everyone knows that chocolate and peanut butter are a natural combination. That's why Reese's Peanut Butter Cups are such a hit candy. 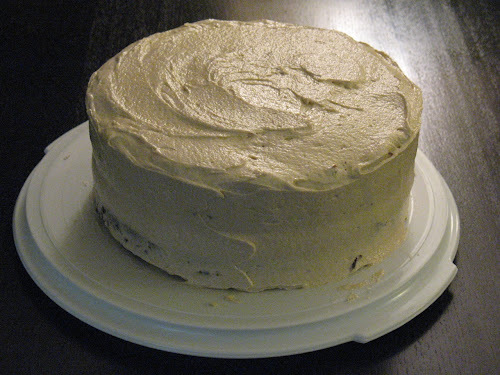 For this cake, which I entered in my office's summer dessert competition, I wanted a cake and frosting combination that did both flavors proud. 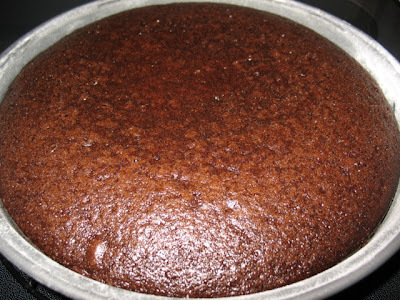 There are lots of complicated recipes for chocolate cakes, but for this I wanted something simple. And you can't get much simpler than Regan Daley's recipe from her dessert cookbook In the Sweet Kitchen. No espresso, dutch process cocoa or even eggs in this batter. You may raise your eyebrows over the vinegar, but in the finished product, it's undetectable. Finding a suitable recipe for the frosting was more challenging. I've made peanut butter frosting before and I wasn't satisfied with it. In my experience, the powdered sugar in a basic frosting overpowers the peanut butter flavor, making the frosting too sweet as well. The nice thing about this recipe (featured on the Washington Post website) is that the cream cheese gives the frosting volume but doesn't detract from the peanut butter flavor. It's by far the best peanut butter frosting I've ever had and really quite good. 1. Preheat oven to 350 F. Grease two cake pans, line bottoms with parchment and flour, tapping out excess. 2. In a large bowl, whisk together flour, sugar, cocoa, baking soda and salt. Make three wells in the mixture, one larger than the others. Add the oil to the large well and the vinegar and vanilla to the two smaller wells. Then pour water over the top. Stir the ingredients until thoroughly moistened but do not beat. 3. Divide batter evenly between two prepared cake pans. Bake about 30 minutes until a wooden skewer inserted in the middle of the cake comes out clean. Transfer pans to wire racks to cool completely. When cool, run a knife around the edge, invert cake pan and discard parchment. Frost cake. Combine the butter and cream cheese using stand or hand mixer on medium speed. Add the peanut butter and beat until very smooth (like 5 minutes or more). Add vanilla, reduce speed to low, then gradually add the powdered sugar. Beat for 2 minutes until the frosting is light and fluffy. 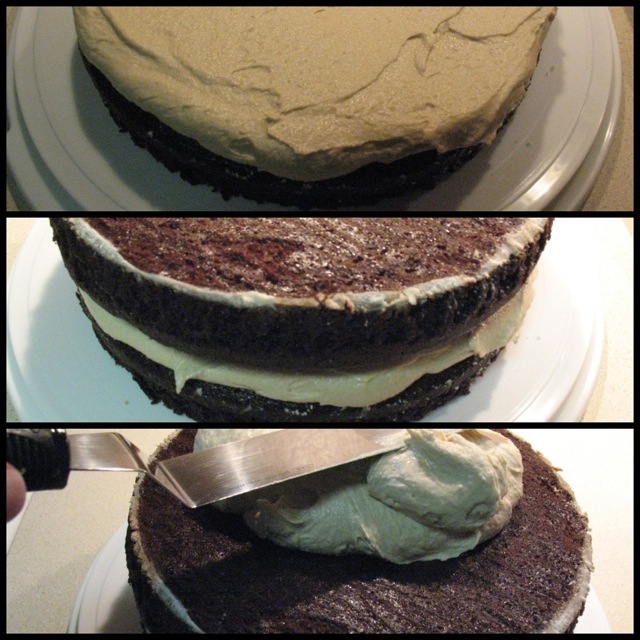 Refrigerate until ready to use (many to need set out before frosting cake if it gets too thick in the fridge). 1) "You Say Tomato, We Say Bonanza," feature by Melissa Clark. Clark celebrates the quintessential summer harvest: the fresh tomato. Tomatoes are just hitting their peak now. For those of you who've still only experienced tomatoes from the grocery store, go out and get yourself a locally grown fresh tomato. They are so amazing right now and vastly superior to the anemic, tasteless variety in the produce aisle. Clark prefers them raw, as do I this time of year. 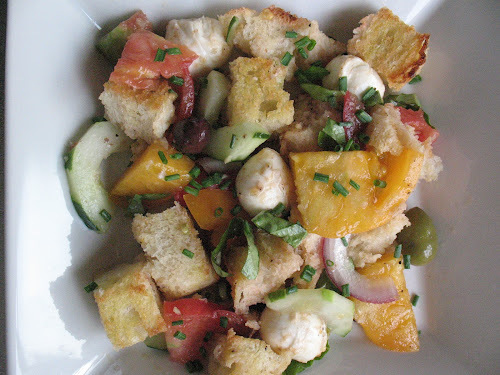 She offers three great salad recipes: Cherry Tomato Caesar; Tomato, Fresh Fig and Blue Cheese Salad; and, my favorite, a Spanish take on Panzanella (Tomato Bread Salad with Chorizo and Herbs). 2) "Sipping on a Sunset, Italy in Mind," article by Jennifer Steinhauer. The Italian Aperitif Aperol is having its moment in the mixology sun. You see it on cocktail menus everywhere. Steinhauer pays homage to the spirit while offering up a few cocktail options. 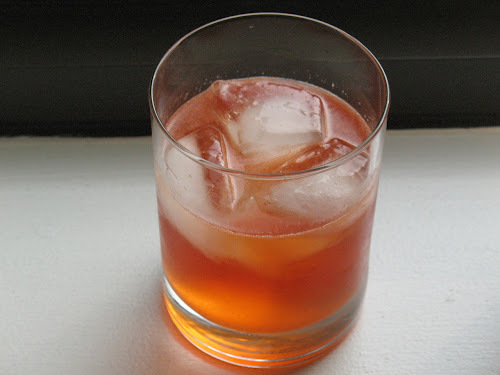 This afternoon, I was moved to buy a bottle of Aperol, from which I concocted a cocktail that will be among the first post-Dallas Drinks cocktails I write about. 3) "An Empire Stretches Its Dough," restaurant review by Pete Wells. Wells reviewed Nicoletta, a new East Village pizza restaurant from Chef Michael White that looks to be the start of a new chain. Wells is less than impressed, rating the restaurant "fair," although that seems generous given the number of criticisms he lobs. There is amazing pizza to be had in New York (I'm still very partial to Gramercy's Posto). There is no excuse for something that sounds so sub par. 4) "Should a Wine List Educate or Merely Flatter You?," the Pour wine column by Eric Asimov. Asimov asks some interesting questions in his wine column this week. He acknowledges the discomfort a diner can feel when examining a wine list that contains nothing familiar. Should a restaurant be obliged to offer some Napa Cab or, in pursuit of its vision, push the diner to try something new? He sides with the latter and makes a good argument for it. 5) "Countdown to a Summer Feast," How to Cook Everything column by Mark Bittman. Bittman whets the appetite with simple recipes for Eggplant Parmesan and Pasta with Pesto, both of which sound quite appealing with an Aperol cocktail in hand. 1) "In a perfect world," feature by Tim Carman. Carman creates a colorful portrait of Jamie Stachowski, purveyor of the Georgetown Stachowski's Market and Deli. 2) "In this heat, dinner should be no sweat," feature by Tony Rosenfeld. This time of year I'm thankful to living in a relatively small space that's easy to cool with air conditioning. But my kitchen can still get pretty hot, so this feature story with a bundle of no-cook recipes is just right as continue to face 90+ degree days in the D.C. August. Herbed Pita Bread Salad, for example, sounds really good. 3) "Brewed to turn heads in Washington," article by Daniel Fromson. It seems D.C. is heating up as a place for making booze. No complaint here, as I've become quite a big fan of DC Brau. As good as that is, it sounds like 3 Star Brewing is going to really push the envelope. The beer has its official launch tomorrow at Churchkey. 4) "Familiar plates, but there's an upgrade in the glass," First Bite column by Tom Sietsema. The food at the new Capitol Hill Hank's Oyster Bar sounds similar to what you'd get at the Dupont and Alexandria locations, but what's special about this new locale is the bar, Eddy Bar, presided over by Gina Chersevani. Love the picture of her carving ice from a giant ice block. The New York Times. Aperol, pesto, wine lists and all those gorgeous tomatoes. The Times hits a home run this week.